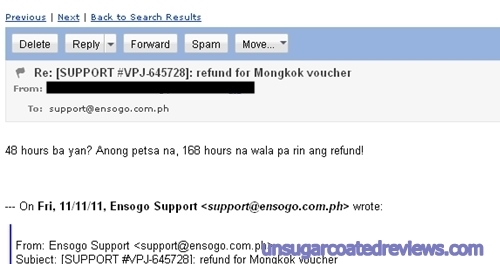 After my disappointment with the Mongkok voucher I bought from Ensogo, I emailed Ensogo to request for a refund. When buying online, I always use either G-Cash, Paypal or BPI mobile banking to pay. These three payment modes give me a stress-free experience because I don't have to worry about banking hours or even leaving the house. When it comes to group-buying sites, using Paypal and Gcash also ensures that my payment gets verified instantly and I get my vouchers within a minute. On a side note: I see a lot of other voucher buyers who pay over-the-counter getting stressed with the late arrival of their vouchers, so if you love deal sites as much as I do, I suggest you get a Paypal or G-Cash account. I did not pester and annoy them everyday (on hindsight, maybe I should have pestered them everyday). Grrrr! My P300 refund became P191, after all the followups via email and their Facebook page (I can't find my wall posts, they probably deleted them). The whole thing took almost four months and I was tired already, I just let it go. 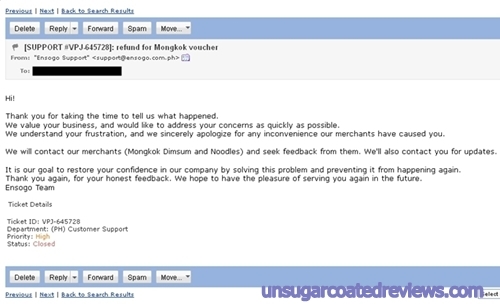 In contrast, my refund experiences with CashCashPinoy and DealGrocer were both smooth. 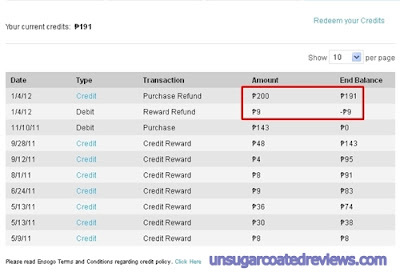 With CashCashPinoy, I had to refund my Mickey's Deli and Sofitel buffet vouchers. The restaurants unexpectedly closed down during the validity period and CashCashPinoy emailed me to inform me of what happened. I got my refunds deposited to my bank account within ten days, no followups needed. With DealGrocer, I gave a voucher to a friend who got pressured by the merchant to invalidate the voucher and to sign up for an expensive membership instead. When I asked DealGrocer for help, they talked to the merchant and helped my friend get a refund even though they could have easily washed their hands since the transaction was between my friend and the merchant. Good to know you had a pleasant experience with us. Hi! 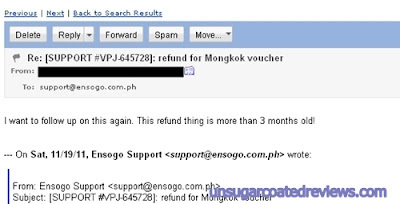 How do I get refund from Ensogo? You can email them your request. I sent my refund request emails at support@ensogo.com.ph. State your reason, voucher #, order number, name of the deal, your full name, email used in Ensogo, and how they can refund you (bank account info or let them know if you're willing to accept credits instead). Ensogo tends to be slow and forgetful, so always remind them via followup emails and by posting on their Facebook page.